This is a full, rich book that is sure to satisfy women’s fiction lovers a hundred times over! I more than loved this book, and you know how much I LOVE women’s fiction! I was in my glory! This book is extremely character driven, which I love, too. Every character is unique and great in their own way, and you know with a character driven book there are going to be a lot of ups and downs with all the characters. Yes, that did happen in this book. The characters had very active and full lives, and the best part is I could relate to where this story took place so well because I was there once, a long time ago. Prince Edward Island is off the eastern shores of Nova Scotia, Canada, and is one of the most beautiful islands I have ever seen. Why, you wonder? Aside from the fishing, it is farmed, and that is the beauty of it. The land is so expansive you can see this from the car alone, along with the many different crops that are grown, making it look like a patchwork quilt. The pure beauty is really indescribable. The reason this book got it’s title is there are a lot of Harbors on this island (it’s surrounded by water, of course), they name the Harbors. For this book, the author named it ‘Chance Harbor’, and that so goes along with this book! Anyway, if you are ever in the area of Nova Scotia, Canada, make it a point to visit Prince Edward Island! Being a character driven book, there is a lot of discussion between the four characters. Eve, if you want to even consider her a mother, is mother to good daughter, Catherine, and bad daughter, Zoe, then a grandchild comes along later in this story, Willow. The problem? They don’t all act their ages. Problems arise, different people have to take control of the different issues that pop up in their lives, and the secrets, oh, the secrets that come out! The issues that occur when Eve decides she wants to sell the vacation home on Prince Edward Island! Not pretty, and the secrets, oh, the secrets. So now I’ve found a new author I want to read MORE from! Her writing grabs you from the very start, and you just don’t want to put this book down at all. This author really has a hold on you! If you like women's fiction, then you need to read this book! This book is one that would be an excellent Book Club pick! It’s even easier to be a Book Club choice because there is a Conversation Guide in the back to help you along. I want to thank Penguin/New American Library for providing a print copy of this book for me to enjoy reviewing in exchange for a review of my own opinion. Wonderful review Laurie. I have not tried this author, but this certainly appeals to me. TGIF! Thank you for the compliment on the review! Yes, I truly enjoyed this book! I DO want to read it a 2nd time through, but slower this time so I can enjoy it more again! This author has several more books she has written, too! I don't see her stopping anytime soon, either! This is the first time I have heard of this author, too! I'm SO glad the publisher sent this out to me! I'll have to tell the publisher I'm getting good feedback on this book! She and the author will be very happy! I've had some other good feedback on this book, too, elsewhere! This is a GREAT author to read! Enjoy!! Thanks for reading this review while you were here! Don't you just LOVE the cover!!! I have COVER LOVE for this one!! See you in a few days for the #HOHOHORAT!!!!! FUN!!! Laurie, I love it that you and I share an enthusiasm for PEI! 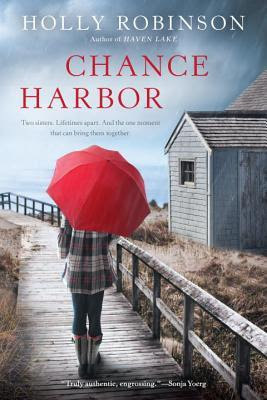 Thank you so much for taking the time to read & review Chance Harbor. It's a pleasure to meet you here--and I totally agree with you about the cover!